Mother’s Day Sunday afternoon the neighbor’s cat caught a small bird, a sparrow, perhaps? Neighbor was able to rescue the terrified bird from the over-excited cat’s mouth – Have you ever seen a pet cat with a bird in its mouth? They’re funny about it, growl-y and amped, racing about but not injurous – and brought it to our house. Which seems like an odd decision unless you know my family and the zoo we call “Home.” This is not the first time a bird has recovered in Teen’s room. He has a red shoe box that might as well by now be designated for this purpose. It contains an old worn-out soft dish towel in which he places the bird in need of shelter. He shuts the lid tight and leaves it alone, for hours at least, or until he hears fluttering. No bird has ever died under Teen’s watch, mostly due to playful but not mean cats. Mondays are my work-at-home days. As I soaked in silence, working hard and fast, I heard a Thump! from across the house. No one was home, so I had to get up and check. In Teen’s room I found a red shoe box on its lid, our own cat batting at the side; she must have heard fluttering wings. And Teen must have been overly distracted to uncharacteristically forget about Bird in Box. I shooed the cat away, grabbed the box, and ran outside. Well, not entirely accurate. As I snatched up the box, my first instinct was to open it and see if the bird was okay – first one cat, and then another… sheesh! Thankfully, I thought twice and did not open the box in the house because that would have been fun. I ran outside and shut the slider behind me (no more cats in this game). I did not pause to grab a camera of any sort, a non-decision I regretted instantly as I lifted the lid. 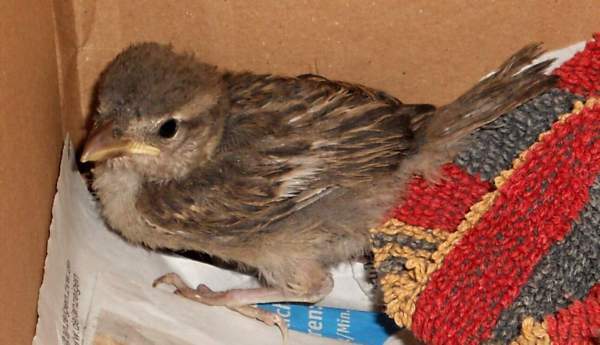 There sat God’s perfect creation of a bird, stunned by two cat attacks in less than 20 hours. It blinked at sunlight. It did not look at me. It sat so still that I considered whether I might have time to run inside for a camera, and then it took off for one of our large pine trees and I lost sight of it in the branches. It flew straight-line, not bird-limping, though I’m not sure I’d know what that would look like. The bird embodied wholeness, perfection, freedom. My mom has always said she’d like to fly like a bird. I’m afraid of heights and prefer my feet on solid ground, though I admire the instinct to soar. The bird did, the bird was, perfect Bird. Honestly, at first I felt exasperated that Teen had forgotten Bird, and then I felt elated – I got to release Bird, to watch healthy and whole Bird fly away to a hopefully much longer bird-life. This has not been my role in the family, to help hurting creatures. And now I get it in new ways, this desire to love God’s creatures in need of care. I am grateful. In the same breath, I thanked God for my own creation, redemption, freedom. He created me; I am injured and He rescued me; He freed me to live in wholeness, to be the person He created me to be in the first place. I can soar with Bird, even with my feet on Solid Ground. Reflect on a time when you or someone you know was involved in a search and rescue (official or unofficial). Who or what got lost, and what happened? Compare and contrast the “dead” life (vv. 1-3) with life with Christ (vv. 4-10). How are “this world,” “the ruler of the kingdom of the air” and “the cravings of the flesh” spiritual forces in opposition to the Spirit of God? Notice all the verbs where God is the subject. What does God do? What do we do? For what reasons does God save us? How is your life different because of God’s great love for you? How have you seen people try to earn salvation? When have you personally experienced this temptation? Why do you think grace can be so hard to receive? To offer? Read 1 John 4:10-12. How are love and grace related? What will you do to more freely extend God’s grace to others? What good works do you think God has planned for you to do? Pray that you will live more fully into the reality of your salvation by God’s grace and that you will take every opportunity to extend God’s grace to others. Some years ago I worked as a church receptionist. Lydia held a volunteer position that brought her to the office frequently. Unfortunately, Lydia was a true Grumpy Pants. Nothing pleased her and she was quick to let everyone know. I cringed inwardly when I saw her coming. She took all my patience and then some. Lydia also sat near me in worship. If you attend church regularly, you know that people tend to sit in the same seats week after week. I sat on the aisle, and she sat on the opposite side of the same aisle a few rows back. In a small-ish church, that made it impossible to avoid her. I can’t remember why now (except that I will happily credit the Spirit’s motivation), but I made a conscious decision to offer Lydia a hug every time I saw her in worship (impractical in the office as I interacted with people through a sliding glass window). I’m sure she was surprised the first time I extended my arms to embrace her, but she didn’t resist me. Better yet, she didn’t slug me. Over time, she started to smile. More time, and she not only smiled but spoke kind words. The hugs changed us both. I overcame the resistance of my heart to hug her and saw God smiling on my decision in Lydia’s own smile. She must’ve really needed a few good hugs! Oh, sure, she still grumped now and then but she also chit-chatted. One might have even called us friends. When Lydia eventually moved away to be closer to her grown children, instead of being glad to see her go as I once might have, I felt her loss. God made a decision to deal with our much worse than Grumpy Pants condition when He offered the outstretched arms of His Son on the cross, embracing us in love and grace. We didn’t deserve it. We didn’t even know we needed it, but oh how we needed it. How we need Him. Jesus Christ is our peace. On the cross He made peace between us and God and between us and others. Relationships that seemed hopeless have become possible, better yet, peaceful. Because of Jesus, our Peace, life can be peace-filled. The potential for conflict lurks any time people gather. Some shy away and prefer to do what they can to grow in faith on their own. While I’m all for solitude, it’s truly in relationship with one another that we learn to more fully love God and receive His love. For those who follow Christ, the possibility of peace gives us hope. It causes us to extend our arms toward others in reflection of Christ’s arms extended toward us. It’s not easy – like Christ, we may at times pay a high price – but it is good. Reflect on a relationship in which you have experienced hostility. What can you learn from that experience? Describe the “former” relationship between Jews and Gentiles. Are there any parallels to this dynamic today? Describe what Jesus did to change that relationship. How is God’s “new humanity” (the Church) intended to be different from the world (v. 15)? Culturally, Western Christians have tended to emphasize personal salvation. Where in this passage do you see individual and/or corporate identity in Christ? How does individualism in our culture create barriers to unity among God’s people? How would someone who is not a Christian be able to tell that Christ is the cornerstone of your life? Which of your relationships is most in need of Christ’s peace at this time? What will you do differently this week to invite Christ to bring peace into that relationship? Pray that the peace of Christ will rule in your hearts, in your worshiping community, and in the world.